I hope you are all enjoying this beautiful weather. Wish I were on the golf course every day! There are several important events coming up in the next several months. The first is our Annual Maundy Thursday Observance on March 24. There is an article about this elsewhere in the Rite Word. As Scottish Rite Masons, we are called to attend this Solemn event. I hope many of you will attend. 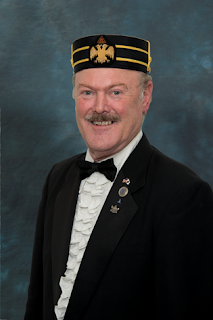 Looking ahead, we have our Annual Grand Master’s Reception for MW David Perry on Tuesday, July 12. This will be in conjunction with our July Stated Meeting. We will be having a special dinner that night to honor the Grand Master. Please put this on your calendar NOW and plan to attend. Its also not to early to make reservations! You have read our dinner reservation policy on the front page. Enough said. Call & make you March reservations. There are still over 100 Brothers who have yet to pay your 2016 dues. If you are one who hasn’t yet paid, PLEASE contact OUR office (not Supreme: costs us transaction fees) and pay by credit card (EASIEST!) or mail a check.